After playing the title role in ‘Baahubali’, Prabhas’s next is an ambitious hi-tech action drama titled SAAHO.One of India’s best epic fantasy films – Baahubali’s star performer Prabhas is all set to win hearts again with his next trilingual movie called ‘Saaho’. Just as the expectations on ‘Baahubali 2′ are rising, fans of Prabhas across India have been speculating and anticipating Prabhas’ next film.Prabhas has become a household name after his portrayal of the title role in Baahubali. 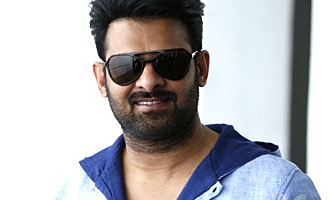 Fans, followers, critics and the industry are waiting breathlessly to see Prabhas on the big screen again. The actor undertook immense prep to get into the skin of his character in ‘Baahubali’, and ‘Baahubali 2’ promises to be just as exhilarating. In ‘Saaho’, however, it will be a different Prabhas in a different role, a very different setting, put together with a very different recipe: think very fast-paced and high-tech action on a huge scale, with a healthy dose of romance with handfuls of thrills and pinches of drama. ‘Saaho’ will be a new, exciting and saucy mix, but put together very tastefully and served with style. As interesting as the title and lead actor is the rest of the intriguing cast, with some big names from all over Indian filmdom. UV creations is a leading production house down South and it was established in the year 2011 by Vamsi,Pramod and Vikram. The movie is directed by Sujeeth and is being filmed at striking locations in, around and outside the country. Music by the awesome trio of Shankar-Ehsaan-Loy and lyrics by the very talented Amitabh Bhattacharya, are sure to jazz up our playlists. You can expect the director of photography Madhie and production designer Sabu Cyril to do a spectacular job with the film. The movie will showcase high-octane action sequences for which the makers have roped in a world acclaimed action choreographer.’Saaho’ is being shot simultaneously in Hindi, Tamil, and Telugu. Look out for the teaser for your first taste, which will be attached to the upcoming release of ‘Baahubali 2’, one of the widest releases of this year.Saaho is expected to deliver a triumph of scale, size, and spectacle! Don’t forget to catch the official teaser on April 28, 2017.